Pictured are the DC Horoscopes for Spring Equinox 2019 and Summer Solstice 2019. 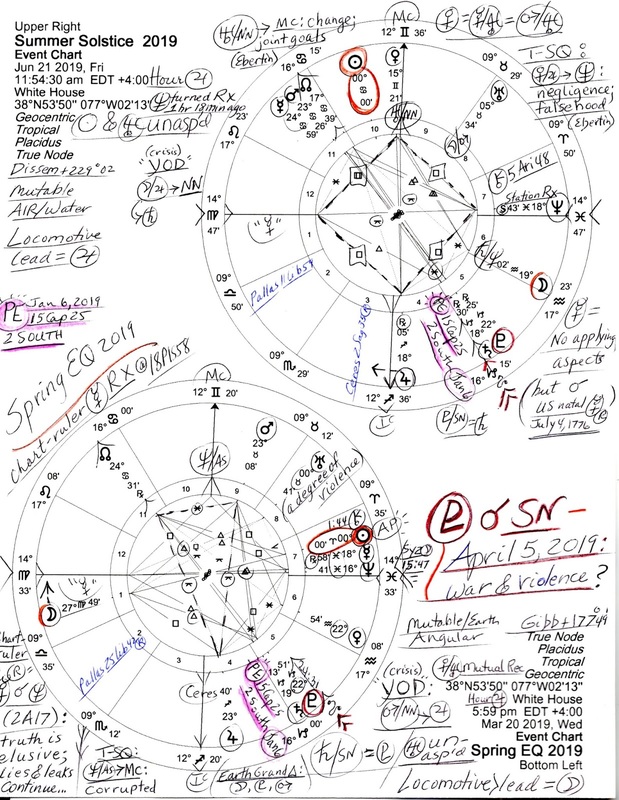 Added is a significant date: April 5, 2019 when my Solar Fire Gold v9 software says is the exact conjunction by transit of Pluto and the South Node of the Moon, a Saturnian point of separation (with a potential for neurosis). 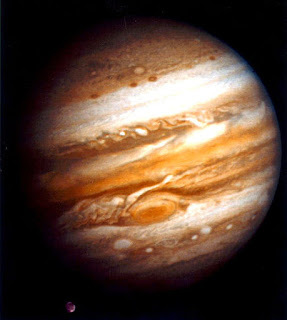 The Pluto-SN cycle can time issues of war and violence within the Collective so a difficult period may be expected. 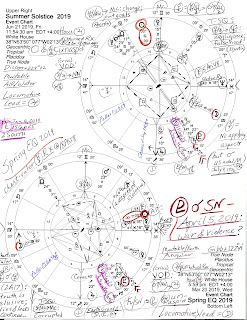 In addition, zealous anarchist and disruptive chaos agent Uranus @00Tau41 in the Spring Equinox 2019 chart conjoins Hitler's Trigger Degree of violence (his natal Sun degree which, when activated by planetary transit during his lifetime, inspired violent behavior, and as you know, Taurus is a sign of intolerance: Uranus in Taurus = premature action leads to failure; risking all in one go; speculation--Ebertin). 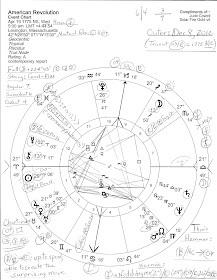 Both charts show a Locomotive shape of success and power with the changeable Virgo Moon leading the engine in Spring 2019 and expansive Jupiter in its own sign of Sagittarius leading the train into Summer. Also, both seasons are influenced by the same Solar Eclipse Saros Series, the 2 South, which manifests on January 6, 2019 @15Cap25. More about that in a later post. Then as you see, transit Saturn and Pluto near one another but their Great Conjunction won't perfect until January 12, 2020 @22Cap46. 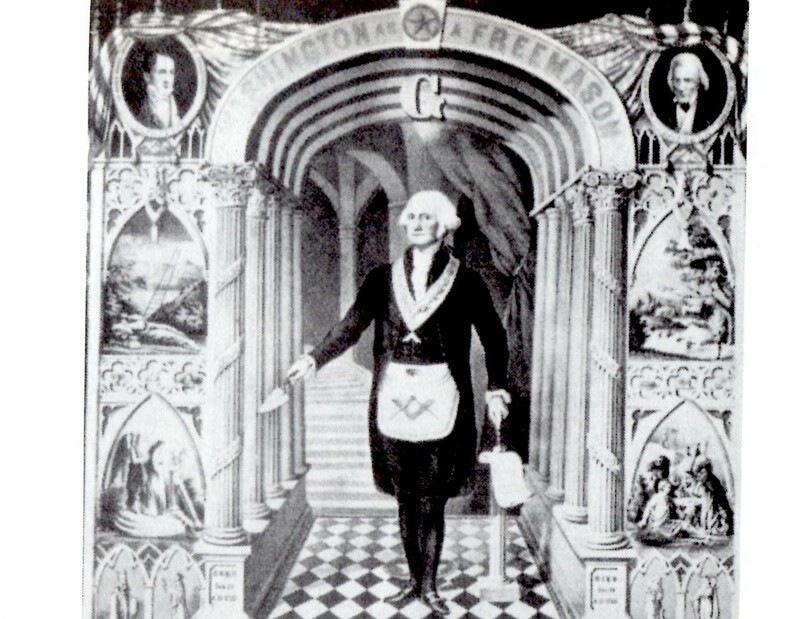 Until then the world is mired within their current cycle which began with the Reagan-era conjunction of November 8, 1982 @27Lib36, 1 degree from the position of the tomorrow's New Moon October 19, 2017 @26Lib35 which times a controversial public speaking engagement by a White Supremacist Richard Spencer whose organization rented a venue for the occasion on the University of Florida campus. As you know, Saturn-Pluto blending their energies = brutality, cruelty, tragedy, violence. A related topic: The Two Solar Eclipses of 2020. Thank you, Jude, for your excellent work. I always look forward to your latest posts. Glad to do it Jackie O thank you for kindly commenting!